When it comes to mold, MasterTech understands and appreciates the risk that you and your family are up against. Safety will always be MasterTech’s first priority. From the initial consultation to the last step of mold remediation and final recommendations, we also keep you and your family’s safety and best interest in mind. We take time to stress to every Mastertech employee that doing the job right the first time is not our goal – it is our standard. Every MasterTech employee is carefully trained and equipped with the necessary skills, knowledge, and tools to ensure we exceed your expectations. If you are concerned about a developing mold problem in your Swedesboro, NJ home or business, you should consider hiring a trustworthy mold professional to complete a mold inspection in Swedesboro, NJ. After completing a comprehensive mold inspection, your MasterTech mold inspector will be able to draft a full report or you. The report will be a compilation of all information gathered from the inspection in a clear, easy-to-read document for for your records. Upon request, your inspector will compose a detailed scope of work most appropriate for your specific mold case. Each mold scenario is unique, depending on a multitude of factors. It is important that the scope of work for your specific Swedesboro, NJ mold remediation is custom developed to address your individual mold needs. 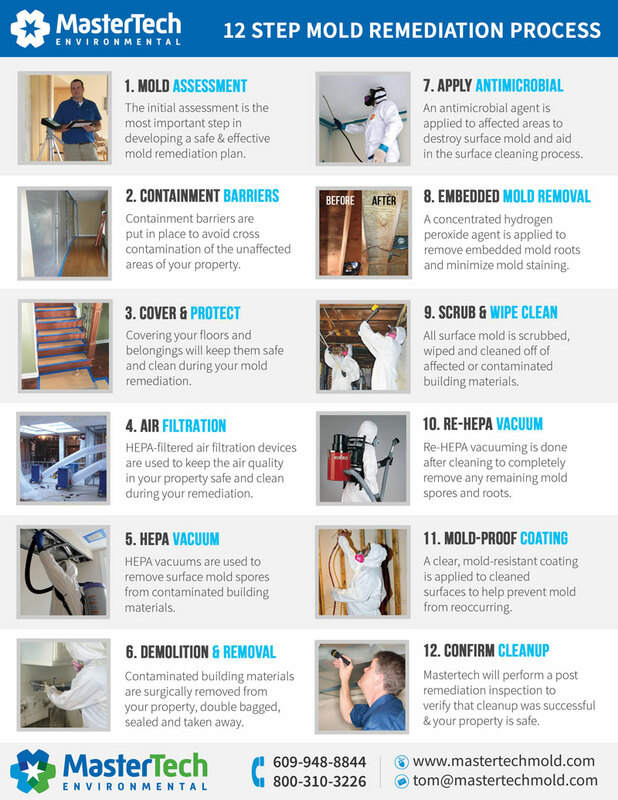 While each mold remediation should be tailor-made, there are some general priorities that apply to every mold remediation. At MasterTech, we have developed a step-by-step mold removal process that is safe, effective, and efficient for your Swedesboro, NJ home. The cleanup process integrates the safest and most up-to-date methods, tools, and technologies. This way, we can be confident that the job is done right the first time. As a demonstration of our commitment to getting the job done right the first time, each MasterTech mold removal in Swedesboro, NJ is backed by a 5-year mold-free warranty. It is our promise to you that the mold is gone, and it will not come back. At MasterTech we use oxidative mold remediation that harnesses oxidizing agents, surfactants and surface cleaners that target bio-contaminates found in our homes, schools and commercial buildings. The oxidative remediation process has been proven to be more effective at removing bio-contaminants than any other remediation method in use today. Not only is the process more effective, it is also environmentally safe. The process does not require the use of powerful pesticides and there are no dangerous residual chemicals or heavy metals remaining after remediation. Because the process is safer and more effective, Mastertech’s professional remediators are able to increase project safety and efficacy. REMOVAL is only one safe and effective method when handling a mold contamination. All too often, we see mold “professionals” that offer quick “treatment” of mold without physically removing it. They’ll tell you that treatment and encapsulation with their magic mold products will resolve your mold problem. The truth is that even non-viable mold spores can cause health problems in certain individuals. So removal is key. It simply cannot be safely “treated”. Take some time to do your research and do not be shy about asking a lot of questions. 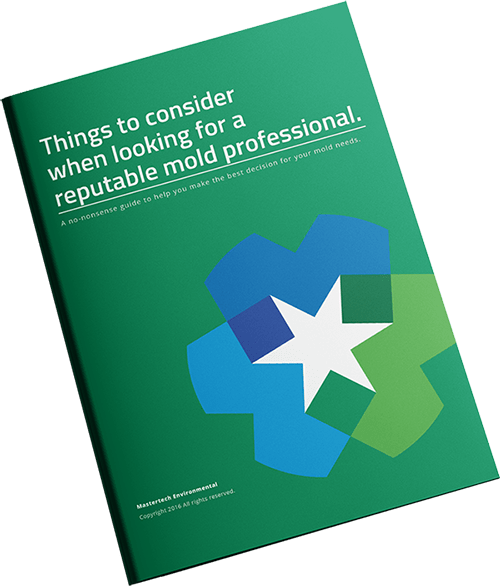 Finding a trustworthy and reputable mold removal company in New Jersey will help to avoid falling for some embellished mold “treatment” pitch that seems too good to be true. A reputable company will honestly help you differentiate between fact and myth. Are you concerned about potential mold development in your New Jersey home or business? Call MasterTech today to schedule a mold inspection in Gloucester County, NJ. For mold inspections and mold removal in Greenwich Township, NJ or mold inspections and mold removal in Monroe, NJ, call 1-800-310-3226 to speak with a member of the MasterTech Team now!